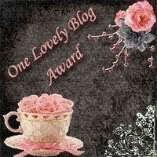 Before we went on our mini vacation, I was awarded the 'One Lovely Blog Award' from Janice. Thank you so much Janice! I was so surprised and excited. Go check out her blog when you get the chance! Love it! So here's the thing. I have accepted awards before where I had to pick 15 bloggers to pass this on to. Most of them just don't care about the award and usually I just pick 15 random blogs. I am always so grateful when receiving any award and since rules are made to be broken, I am only going to pick 5 blogs for this award. I know, I'm awful. Congrats to all the bloggers receiving this award! Your blogs are awesome! awe! Thanks so much Melissa!! I'm really flattered that I made the top 5!! Thank you so much! I really do appreciate it! You just made my afternoon so much better! Thanks for the award! I have been fairly MIA on the blogosphere for a couple of weeks so I am just now posting about it.